It seems that everywhere I look people are trashing 2009 . . . what a terrible year it was, no one's sorry to see it go, let's beat it up on the way out . . . or something like that. I wouldn't say it was my best year, but I'm too much of an optimist to say bad things about it. I'm sure lots of lovely things happened in 2009, like . . . um, well . . . I'll get back to you on that. In the meantime, I've come up with a mantra for the new year. You better make sure you are sitting securely in your chair because it's so good, it's going to rock your world, and I don't want anyone falling and hurting themselves. Ready? Here it is . . . Transcend 2010. Just let it sink in. Feel it. Love it? I know. I don't technically do resolutions this time of year, but I can't ignore the need to be healthy, cook more, exercise more, save money (blah, blah, blah). So, in the spirit of transcending 2010, here are some fresh blogs for inspiration. Sinner and Jim of Auckland, New Zealand post a variety of Asian and English recipes such as Steamed Barbecue Pork Bun, Chicken and Beef Satay (below), and Lemon Yoghurt Cake. There are rednecks in New Zealand? And they cook Chinese, Indian and Thai? I googled for more info . . . all I learned is that Waitakere is New Zealand's fifth largest city and the terrain ranges from treacherous black sand beaches to forest-covered mountain ranges. Mrs. Ergul describes the premise of her blog this way: "Being a Singaporean Chinese, Chinese food naturally is the regular on our dinner table. Occasionally, I will try making new Türkish dishes to satisfy my better half with some comfort food that reminds him of home that is a million miles away . . . Other than bread which I bake regularly, I like to expand my repertoire but some just look so daunting. That is why I'm part of the Daring Bakers community to push myself further." 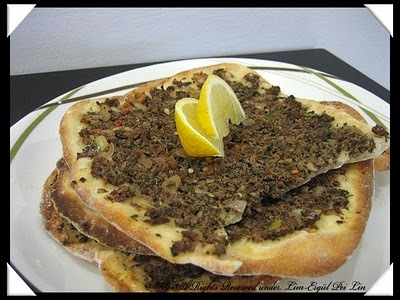 Recipes include Lahmacun (below), Soy and Sesame Pumpkin, and Vietnamese Spring Rolls. I, too, wish to push myself further, Mrs. Ergul. I have never been vegan nor do I plan to be . . . but I do like the idea of a little bit of vegan every week . . . even if it's just one meal. 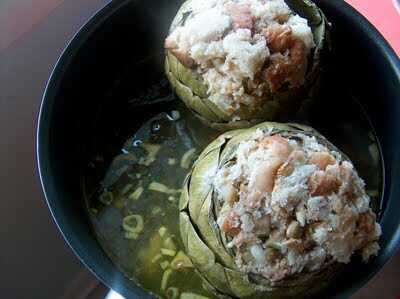 I also like this blog by Bianca, which is about "Eatin' Vegan in the Dirty South." Recipes include Sweet Tater and Almond Butter (below), Healthy-ish Biscuits and Gravy, and Holy Mole Chile. Oh, Tomato Kid . . . where do you get your knowledge? I could read your mysterious blog all day. Here's a couple samples from the "talk about food and health." In order to stay young, you must remember the name of the following foods: chicken skin, fish, caviar, shrimp paste, oysters, liver, mushrooms, edible fungus, pollen and so on. They are rich in elastic fibers, or nucleic acids, helps to maintain smooth skin. I almost skipped this one just because of the title. But upon further review, Karen Evans of Ohio provides clear and minimally-annoying information on a variety of health-related topics. Here is an excerpt from her post regarding smart choices at McDonald's. Eating at McDonald's might not be smart to begin with, but there are those times, especially with kids, that it does have its advantages. And yes, I did know that apple slices have fewer calories than fries, but it's helpful to see the numbers. For a healthy side order, avoid the fries which come in at 380 calories and 19 grams of fat for a medium order. 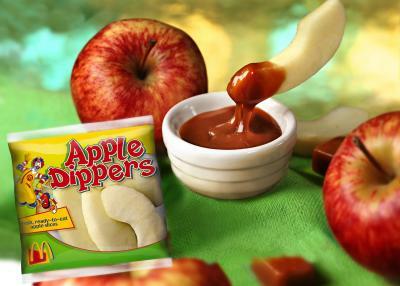 Instead, consider the Apple Dippers. Even with the caramel apple dip, the calorie count is just 105 calories. A second option would be the Side Salad that has just 20 calories. Even with a serving of low-fat dressing, the side salad would only clock in at 60-80 calories depending on the dressing you choose. But then again, Dr. Mirkin of Maryland explains in Junk Food Alters Intestinal Bacteria in Just One Day that "after just one day of switching from a plant-based diet to a high-fat-and-sugar diet, mice with human intestinal bacteria developed bacteria associated with obesity in humans, and soon became grossly obese (Science Translational Medicine, November 11, 2009)." What else can you share, Dr. Mirkin? This charming blog by Ildie, a self-described sassy woman from Ohio, is a little random but there will be no criticism from me about randomness. Ildie apparently enjoys exercise and watching what she eats. I can forgive her though, because she also loves coffee and cookies. Check out her nice photos. The first one is the oatmeal she made for New Year's Eve. Alicia Lynn Carrier of Portland writes about her pursuits in healthy cooking in a down-to-earth, reasonable way. She shares creative ideas like throwing curry paste into pea soup and appealing recipes like her mother's stuffed artichokes. These similarly themed blogs feature coupons, deals and other offers . . . like Free Meals at Ikea or an amazing deal on a canvas photo. Save Your Money Mama also includes product reviews while Discount Queens offers Coupon 101. I sometimes clip coupons but always forget to use them . . . maybe these sites will help. We'll see. Would love to hear more blog recommendations to . . .